We had a great opening reception for the Holiday Creative Challenge Exhibit! Want to see a little peek? CLICK HERE! GUEST BLOGGER Call-out! Any artists who might be interested in doing a guest blog post, please message me. 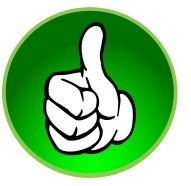 We are looking to hear about your creative process or any interesting story about your business. CALL FOR ARTISTS! Star Trek Vs. Star Wars @ The Tech Garden, January 2016 For more info visit The Gallery at The Tech Garden. Dec 5 :: Kathy Smith of Venice in the Valley will be showing at the upcoming "A Wonderful Christmas Craft Show" being held at the Folktale Winery from 10am - 4pm. They are located at 8940 Carmel Valley Road, Carmel, CA 93924.
:: Check out these handmade finds! From LOVE MY ART JEWELRY. The following artists donated their work, with ALL of these gallery sale proceeds being donated to the AMERICAN FOUNDATION FOR SUICIDE PREVENTION. On display at the Holiday Creative Challenge Exhibit, "It's a Wonderful Life", opening reception tonight at Ooak Artisan Showcase. Drawing by local artist, Dan Bertrand. We want to promote your art related news (new designs, special sales or an event). If you just create as a hobby you are still CREATING and we want to see it! Your work can serve as inspiration to the next artist. If you create for charities, let us know. We want to do a shoutout! 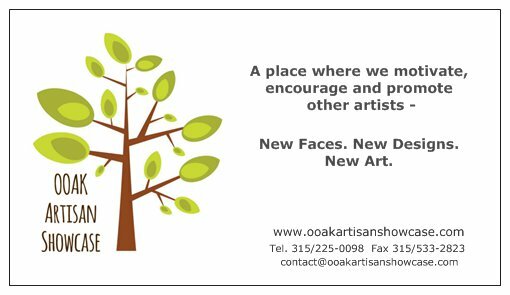 * open to any artist or artisan because we consider "art" to be anything that you produce in your own creative time. We'd love for you to join us, please complete the form linked below so we can promote you more effectively! In the future, send us an email or tag us in your latest work! 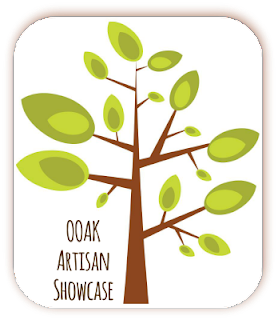 We are OOAK Artisan Showcase – A place where we motivate, encourage and promote other artists. NO STRINGS, just - New Faces. New Designs. New Art. OOAK Artisan Showcase is a PUBLIC forum. We will be posting to these social media sites, so be sure to follow us! Holiday Creative Challenge Exhibit - "It's a Wonderful Life"
OOAK Artisan Showcase extended a SPECIAL holiday creative challenge to jewelry designers, greeting card makers, photographers and visual artists (mixed media, ceramic artists, painters and the like). 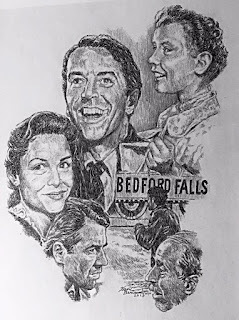 This year's challenge is based on our theme, “It’s a Wonderful Life”, the classic holiday movie. ALL submissions are on display in a SPECIAL holiday exhibit in our gallery, located at 425 W Thomas St., Rome NY. The exhibit opened on Friday, November 20th at 6:30 pm with a public reception and runs through December 31, 2015. COME SHOP with us - SHOP Handmade! Our gallery will be open for your holiday shopping on both Friday, BLACK FRIDAY, November 27 and Saturday, November 28 from 9-4 pm. Additional Hours will be announced soon. Watch Facebook for updates! The exhibit is being held at 425 W Thomas St., Rome NY. A percentage of the sale proceeds will be donated to the American Foundation of Suicide Prevention. 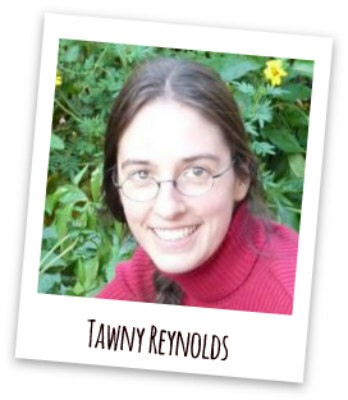 I had reached out to Tawny Reynold of Sundrop Jewelry to ask if she would share with us her creative process. I am happy to report that SHE DID! 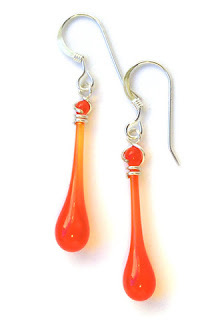 Sundrop Jewelry is handmade from recycled bottles and stained glass, and melted with sunshine and a giant magnifying glass! My magnifying glass (technically a fresnel lens, originally designed for lighthouses) measures 2.5 by 3.5 ft, which is about as big as they get. The larger the lens, the more light can be concentrated, and mine can reach up to 3000 degrees fahrenheit - but only on a clear day! The biggest difficulty with using focused sunshine is that my work is weather-dependent, and the temperatures fluctuate quite a bit. Is the sun high or low in the sky? Is the sky hazy or crystal clear? And most important - what color glass am I working with? 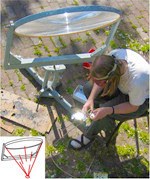 Dark-colored and opaque glass will absorb all the light (converting it to heat) on one side of the glass, while the other side of the glass remains cold. In contrast, light-colored translucent glass lets more of the light shine right through and does not heat up as much. Clear glass won’t melt at all! Concern for the environmental impact of Sundrop Jewelry has been a mainstay since the beginning. Though my original partners left to form an environmental non-profit, our shared vision of sustainability and creative re-use continues. I use recycled materials whenever possible, using reclaimed sterling silver findings, packaging with recycled content, and minimizing and recycling the inevitable business paperwork. And, of course, using glass bottles otherwise destined for the trash or recycling bin! Since the color palette of glass bottles is generally limited to blues, greens, and browns, I fill in the rest of the rainbow with stained glass. I grew up in Alaska, which still holds on to a bit of the old "use it up, wear it out, make it do, or do without" motto. That mentality really encourages learning to make your own... everything. And to improvise as needed. I took community classes with my mother when I was young, including stained glass, lost wax casting, pottery, paper mache, and more, and she was often working on some kind of project. I did a little bit of everything, but only really got into working with glass as an adult. 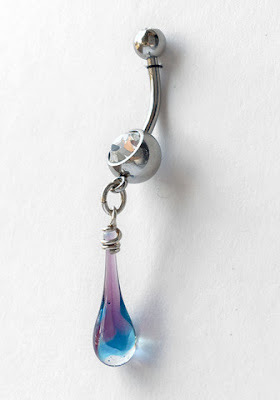 I am inspired by colors, and I love the way translucent glass glows in the light. 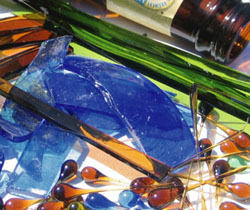 A new bottle color, a sheet of glass or millefiori rods in the glass shop - I want to try them all! And I am always excited when I find a bottle in a new color! 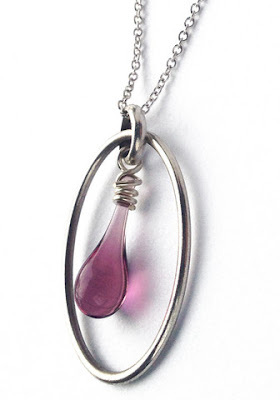 My work can be found online in my shop, http://SundropJewelry.com, and I occasionally sell at craft fairs in the Bay Area, but my largest market is wholesale. I’m currently in 80 boutiques and science museum gift shops around the United States, including the Mauna Kea Observatory and MIT Museum. I’m always looking for more shops that focus on earth friendly products! Here's Tawny in action ! Who would ever imagine that these delicate sundrops of color were created using such an interesting process? Seeing ALL that goes into each piece just makes these pieces that much more beautiful. Thank you Tawny for sharing with us! This week we are ramping up! We will now feature TWO of our member artists per day… that means if you have signed up as an official member of Ooak Artisan Showcase, we will be looping back and featuring another of your works throughout the week via all our social media spots. Nov 21-22 Kristi Bowman will be at the Snohomish Holiday Market from 10-5pm. Being held at the Thomas Family Farm located 9010 Marsh Road in Snohomish, WA. For more info visit https://goo.gl/4lmk1v. Book :: A good read by Dave Conrey on branding, design and marketing strategies for small businesses - LIFE AFTER CHRISTMAS. Blog Post :: Have you heard of the Jewelry Monk? Read all about it on Love My Art Jewelry's blog.